Kristina pointed out that all my recipes so far took a long time to prepare, and people might want to see recipe ideas that were quick and simple to make. I thought this was a great idea, and so a new category for the site, “Quick Meals” is born. Here is a recipe that I put together quickly with what we had in the kitchen, and it’s quick, nutritious and delicious! First get 2 cups of water boiling in a small pot on the stove. Add the rice, reduce heat to low, and cover. White rice will take about 15-20 minutes to cook, brown rice about 30 minutes, so we want to start it now so it’ll be ready for the soup. Special soup tip: When I make soup I always make the rice or noodles separately and mix them only when serving the soup. The reason for this is if you have leftovers the rice or pasta will continue to absorb the liquid from the soup overnight like a sponge. The next day you won’t have soup, you’ll have slop. Dice up the onions, garlic, and celery, and cut the mini-carrots in half or thirds. Add to a pan with the ground turkey and saute on medium to high heat, stirring, until the turkey is browned and the onions and celery are softened up. Use a spoon to remove the liquid fat in the pan from the turkey- it won’t be much. Add the soup stock. Reduce to a simmer when it starts to boil and add oregano, thyme and pepper. Cut broccoli into bite-size florets and squeeze juice from one lemon. 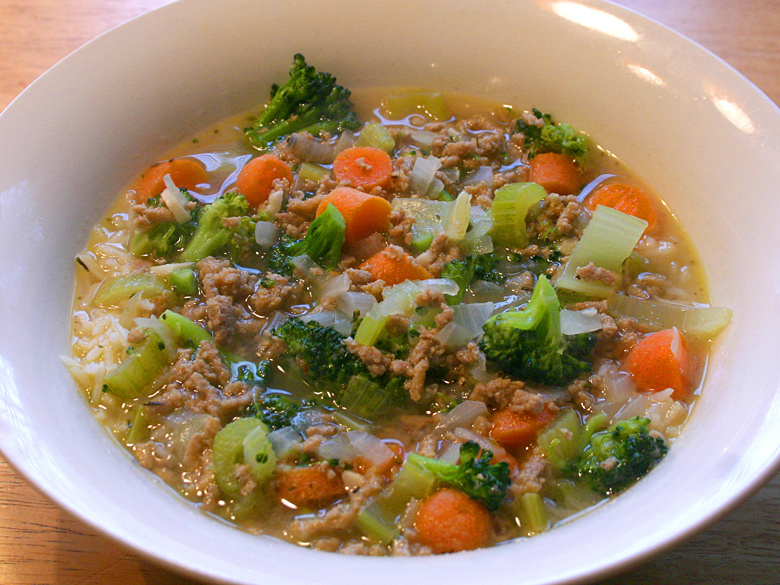 When the soup’s been simmering for about 10 minutes, add the broccoli. After about 20 minutes see if soup is done by checking a carrot piece to see if it’s cooked through. When soup is done remove from heat, add the lemon juice and stir it in. Serve in bowls with rice added and enjoy!